As brides plan their wedding day, they often obsess over finding the perfect dress, rounding up the right vendors, and ensuring that every detail is perfectly in place for their special day. What is perfection though? What makes a perfect wedding day for a blushing bride? Outside of finding the right man to share your life with, what is your idea of a perfect wedding? For my sister and her fiance', the perfect wedding was one in which they could make their vows to each other surrounded by all of their family and friends--one in which they could begin their journey together surrounded by the ones who had led them to that moment. It wasn't about the cake which L.G. ended up sticking her finger into or the flowers which I as her matron of honor/florist had a bit of a debacle with or even the venue which she changed at the last minute so that our daddy could attend. It was all about love--the enduring love that family shares. Daddy has been battling pancreatic cancer for the last five months. 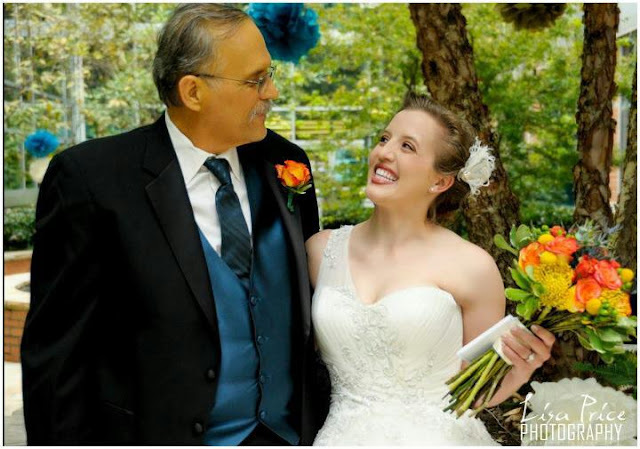 When he was admitted to the hospital last Tuesday for a surgical procedure, the first thought on his mind was that he couldn't miss his daughter's wedding on Saturday and the doctors reassured him that they had every intention of getting him there. Unfortunately, complications from an additional surgical procedure on Thursday resulted in him being moved to the ICU. 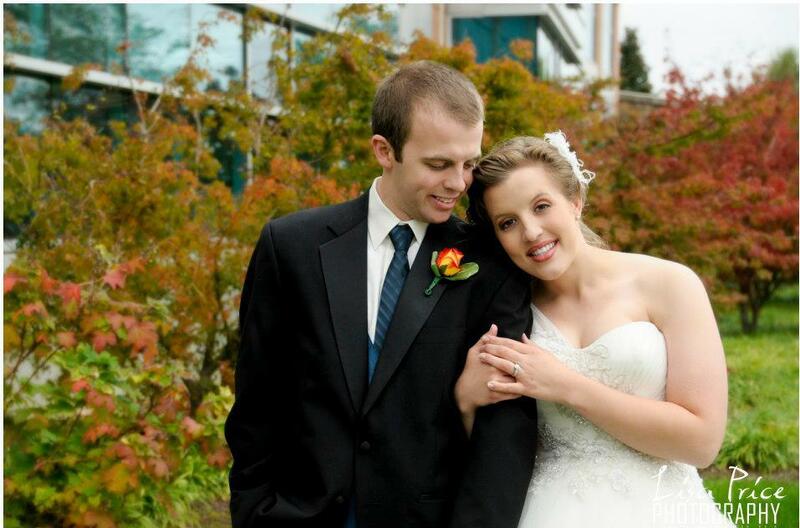 Allison and Carl made the selfless, last minute decision to move their wedding to the hospital where the hospital staff, family, and friends did everything in their power to make my sister's dream wedding come true--a wedding in which my dad could give her away. On Saturday, October 6, my daddy walked my sister through the courtyard of the hospital to give her away in marriage to a wonderful man. And you know what? It was perfect! Oh, this looks so wonderful. Congrats to your whole family on such a special day. Jen, I am CRYING... this is the most beautiful (AND TRUE!!) message. The pictures are so special and I am thrilled that your dad got to walk your sister down the aisle. God Bless your beautiful family! wow! that is awesome! that is the idea of a perfect wedding! I believe a lot of brides get caught up in the little things (as small as the sign in pen at the guest book) but when all reality hits, the most important is the man standing at the end of the aisle and in cases like this - the daddy walking the daughter down the aisle. lovely wedding story. thanks for sharing! That is so beautiful! I'm so glad that your dad was able to walk your sister down the aisle. What a fantastic gift your sister and brother in law gave to your Dad! I cried when I read it. God bless your sister's marriage and your family. Aw... that brings tears. What an AMAZING family you have! It looks like the courtyard was a lovely wedding location! SO glad you're dad got to be there!!!! I am so happy for your sister, that she was able to still have that moment with your Dad. I am pretty sure it meant more to your father than we will ever know. The courtyard looks wonderful in the pictures!